By the time President Abraham Lincoln stood up to give his second inaugural address on a blustery and rainy Monday the 4th of March, in 1865, the Union, what was left of the United States of America, an experiment in democracy less than ninety years old--the country lay in tatters. Torn asunder from coast to coast, from North to South, between slavery abolitionists and slavery proponents. Violent partisanship and anger marked the political and civic dialogues of the day. In less than a month Lincoln would be dead, the victim of assassination. In five weeks, the Civil War would finally end, but not before claiming the lives 618,222 soldiers on both sides, two percent of the nation's population. Imagine 6.5 million war deaths in 2019 and the scale of that cataclysm is clear. And although Lincoln had won a second term, the vote, of course, did not include any of the secessionist southern states. His election opponents, the Democratic Party had called for an immediate peace while Lincoln insisted the war must waged until the unconditional and complete surrender of the enemy. So on that day Lincoln might have been "right", even justified, to condemn the Confederacy in his speech. Vilify them as traitors and turncoats, seditionists to the last man. Lincoln could have used the speech to outline his plan for a harsh Reconstruction, describe how he would now punish these fellow citizens, mete out sharp justice on all those who had started the war, dared to found a new "nation" on the continent. 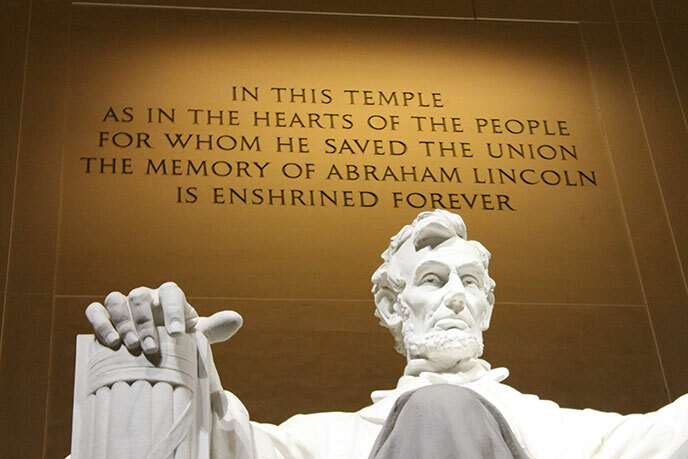 Lincoln, in just seven hundred words, the second shortest inaugural address ever--the man from Illinois known affectionately as "honest Abe" and "Father Abraham": the President chose to lay down his sword, unclench his fist, set aside self interest and party, and instead offered a powerful vision for peace and reconciliation. He did so first, by reminding the country that each side imagined itself in the right. "Both read the same Bible and pray to the same God, and each invokes His aid against the other....[then] let us not judge that we be not judged. The prayers of both could not be answered." As he concluded on that long ago day, "With malice toward none, with charity for all, with firmness in the right as God gives us to see the right, let us strive on to finish the work we are in, to bind up the nation's wounds, to care for him who shall have borne the battle and for his widow and his orphan, to do all which may achieve and cherish a just and lasting peace among ourselves and with all nations." The question still matters, 154 years after one of our greatest Presidents gave the answer and reminded America what true greatness could be and still is. Thank you President Lincoln. God help us all to never, ever forget you and your wise, wise words and great leadership.